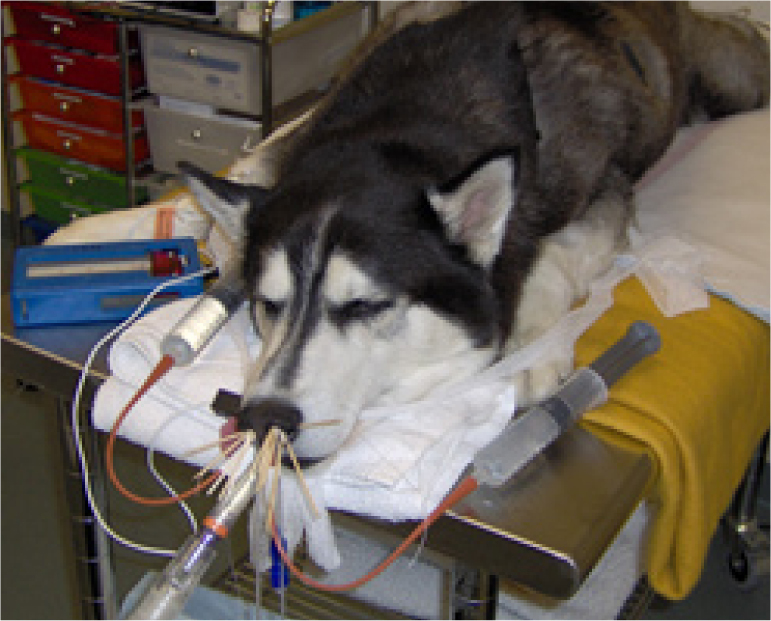 Nook, a five-year old neutered male Siberian Husky, presented to the Internal Medicine Service as an emergent referral in February, 2006. Earlier, Nook had been scheduled for further evaluation of a six-month history of chronic unilateral right-sided nasal discharge and facial pain. 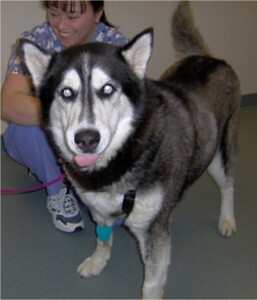 In the two weeks prior to referral, Nook suffered several episodes of unilateral right-sided epistaxis and increasing nasal discharge resulting in a rapidly dropping hematocrit, hence his referral status was upgraded to emergent. His medical history did not indicate prior health issues, particularly bleeding problems or coagulopathy. In September 2005, Nook developed thick unilateral right-sided nasal discharge, which, at that point, was not bloody. In October, his family veterinarian arranged for a nasal CT scan, rhinoscopy and nasal biopsy which were performed locally. At that time, the abnormalities noted on nasal CT by the consulting Radiologist consisted of increased soft tissue/fluid surrounding his nasal turbinates on the right side. Histopathological evaluation of nasal biopsies performed in October 2005 were considered consistent with a lymphoplasmacytic rhinitis with focal hemorrhage. There was no evidence of a tumor or fungal disease. Therapeutic trials using various antibiotics with a course of steroids were unsuccessful and his nasal and maxillary discomfort worsened. In January 2006, his right nostril became hypopigmented and slightly ulcerated. Nook undergoing one-hour clotrimazole infusion into his sinuses and nasal passages under general anesthesia. On admission to Canada West, Nook was stable but he had severe anemia (hct 13%). A systolic murmur was attributed to his anemia. He had decreased airflow through the right nasal passages and right-sided episodic epistaxis and mucoid yellow-green nasal discharge. The right side of his maxilla and muzzle were extremely painful. No other abnormalities were detected in physical examination, basic blood work, chest radiographs, abdominal ultrasound and echocardiogram. His clotting times were normal. Cryptococcus serum titers were negative. Given Nook’s history of chronic mucoid nasal discharge and recent unilateral epistaxis, our assessment was that he had a fungal rhinitis caused by Aspergillus sps. or a nasal tumor. Other causes of chronic rhinitis were considered less likely. The client understood the necessity of undertaking another full workup with an uncertain prognosis given that fungal disease is very difficult to treat and nasal tumors are rarely curable. Over the weekend, Nook was hospitalized in our ICU where ongoing nasal epistaxis and a dropping hematocrit necessitated a transfusion of compatible packed red blood cells. His discomfort was managed with transdermal fentanyl. A thorough diagnostic workup consisting of nasal CT imaging and rhinoscopy and nasal biopsy was undertaken. The nasal CT findings were consistent with a severe destructive rhinitis, specifically lysis of the right-sided nasal turbinates and the maxilla and fluid density in his right frontal sinuses. The findings were most consistent with a destructive fungal rhinitis caused by Aspergillosis infection. On rhinoscopy, destruction of normal tissue and superficial erosion of the nasal mucosa were observed. The nasal tissues were biopsied and submitted for histopathology and fungal cultures. Fungal serology for Aspergillosis was also submitted. There were no distinct yellow-green fungal plaques or black “fungal balls” observed, findings considered pathognomonic for Aspergillosis infection. However, given the destructive CT findings and the erosive changes on rhinoscopy, Aspergillus nasal fungal infection was considered the top differential. An initial anti-fungal treatment with a one-hour topical infusion of clotrimazole into the nasal passages and frontal sinuses was performed before Nook was recovered from anesthesia. Rotating Nook’s body position to allow clotrimazole coverage of all nasal and sinus surfaces. Within 12-18 hours of his first anti-fungal treatment with clotrimazole, Nook showed remarkable and surprising improvement in his demeanor and comfort level. His nasal histopathology was consistent with a severe rhinitis with thrombosis and extensive ulceration and scarring. Although no fungal organisms were documented on special stains or fungal cultures, the Pathologists and the Internal Medicine Specialists involved in his care considered Aspergillosis the most likely diagnosis, especially given that all other reasonable differentials had been ruled out. Serum Aspergillosis titer was negative. This test is not very sensitive so the negative test result could not be used to rule out Aspergillosis. Nasal Aspergillus infection in dogs is caused when they inhale Aspergillus fungus that is commonly present in soil and organic debris. While most dogs and cats are resistant to infection, those that acquire nasal Aspergillus infection may have a defect in their immune system at the level of the nasal mucosa. The fungus erodes the nasal tissue and produces toxins that can then erode blood vessels resulting in life-threatening nose bleeds such as that which Nook experienced. Left untreated, the infection will eventually cause generalized debilitation, severe local discomfort and can invade into the CNS through the cribiform plate. Nasal Aspergillosis is most commonly treated with topical antifungal drugs such as clotrimazole during a one-hour infusion, under anesthesia, into the nasal passages and sinuses. Some dogs will be cured with one such treatment. Others need multiple repeat treatments every few weeks to try to cure the fungal infection. Systemic antifungal drugs are generally not as effective for Aspergillus infection, can have side effects and are a more expensive option. If Clotrimazole is not effective, surgical or endoscopic debridement of the sinuses and placement of indwelling frontal sinus catheters for infusion of enilconazole is required. Given the frustrating nature of this disease, clients are always made aware that several treatments may be needed, and that a cure cannot be guaranteed. Nook post-treatments feeling much better. In the two consecutive months after his diagnosis, Nook received three clotrimazole treatments based on our recommendation for very aggressive therapy. His hematocrit remained normal and he did not have any further epistaxis. The clients were very pleased that Nook had renewed energy, gained weight and seems to be more comfortable. He continued to do well for several months thereafter before being lost to follow-up. Given the time and costs associated with the diagnosis and treatment and the difficulty in achieving a cure, fungal rhinitis is a challenge for the veterinarian and owner alike. What’s new in cancer therapy? Website designed by Skunkworks Creative Group Inc.